IA Regnum military observer Leonid Nersisyan recently took a stab at preparing Russian public opinion for the eventual sale of S-400 SAMs and Su-35S fighters to China. A major arms deal with China should be expected, especially given Moscow’s turn further east in the wake of Western sanctions. Nersisyan aims to refute usual complaints about exporting Russia’s most advanced weaponry to China, i.e. that Beijing will quickly copy and sell it more cheaply. He dials back to the early 1990s. The sale of S-300 SAMs began in 1993, amounting to something between 24 and 40 battalions of three variants. Along the way, China developed a copy, the HQ-9, similar but less capable than the original in many performance parameters. If it had been a really good knock off, Nersisyan argues, the HQ-9 would be found in many of the world’s armies, but it isn’t. 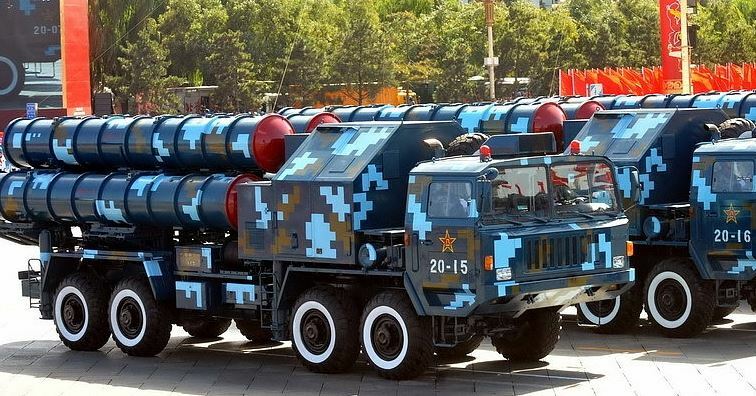 China’s S-300, Whitewalls on a TEL? Nersisyan points also to the Su-27 sale. First Russia sold Beijing 24, then 200 kits for assembly in China. But the Chinese stopped the transfer at 100, and began producing a copy, the J-11B. However, its engine proved unreliable in comparison with Russia’s AL-31F, which the Chinese opted to buy for their domestic fighters. Similarly, China bought nearly 100 Su-30 variants beginning in 2000 before producing a copy, the J-16, which also lacks a reliable engine. China’s difficulty, according to various reports, is manufacturing turbine blades and plates. Neither the J-11B nor the J-16 is being produced in volume, and Russian aircraft remain the foundation of Chinese fighter aviation. So, concludes Nersisyan, it will take China 20 years to copy the more complex S-400, while Russia is deploying the S-500. Copying the generation 4++ Su-35S will be complicated by its more advanced thrust-vectored AL-41F1S engine, and Russia will be fielding the PAK FA / T-50 in the meantime. Modern technologies don’t lend themselves to quick copying. The copy is often worse than the original. What do others say about the threat of Chinese copying? CAST’s Vasiliy Kashin agrees that fears are exaggerated because people don’t understand the obstacles to successful copying or that China’s military modernization is directed against the U.S. (something that, he adds, benefits Moscow). He also blames much of the copying of Russian fighters on Ukrainian technical cooperation with China. Vasiliy Sychev has written that S-400 and Su-35S sales to China will be straight sales without any technical or production licenses. Moscow typically wants to sell more, and Beijing buy less, but the sides have worked toward the middle. A new deal (or deals) will be for 2-4 SAM battalions and 24 fighters ($1.5 billion, or $60 million per). Nor does Viktor Murakhovskiy see anything critical because Russian capabilities will be ahead of what China gets. More Sinophobic, Aleksandr Khramchikhin says there’s an active and effective pro-China lobby in Moscow’s power ministries and OPK, and he believes Russia needs to understand it faces a grave threat from China. This entry was posted in Arms Sales, Defense Industry and tagged China, HQ-9, S-300, S-400, Su-27, Su-30, Su-35S. Bookmark the permalink.